WHAT'S UP THE PIKE: Burtonsville ripe for redevelopment; Indian Spring redevelopment to include new school; ParkView development on Greencastle to expand. 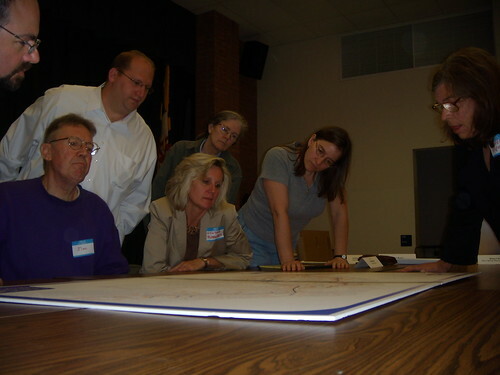 Selected community members inspect maps of the Purple Line at Tuesday night's focus group. 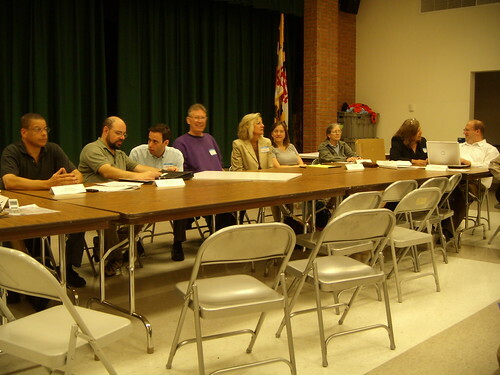 Over one hundred anxious residents packed the Oakview Elementary School cafeteria Tuesday night for the second Purple Line focus group in the Downcounty. Maryland Transit Administration officials discussed three potential routes the controversial transitway between Bethesda and New Carrollton could take through East Silver Spring. After years of debate, many who attended the meeting were frustrated with the lack of trust some residents have for MTA. "I . . . was frustrated by the amount of people who had made up their minds not to listen to the presenters," says Queen Anne's Drive resident Vickie King, a Purple Line supporter. "People just kept shaking their heads at the presenters and applauding audience members who made predictions of doom that seemed to be purely conjecture." 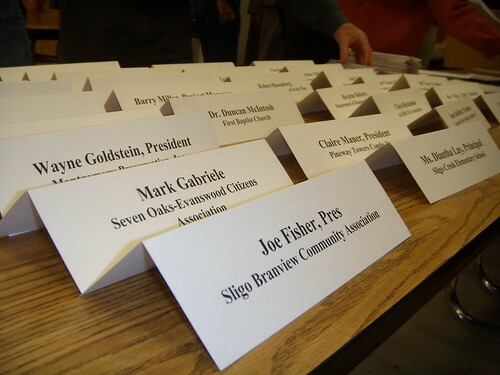 Unlike last week's more open focus group, Tuesday's meeting introduced a table at the front of the cafeteria where representatives from civic associations and local businesses could examine the State's documents in detail. Project director Mike Madden noted that those at the table seemed to be suffering from stage fright. "You all have to look alive now," says Madden, gesturing to the audience, "pretend these people aren't here." The Maryland Transit Administration invited dozens of civic association presidents and local business owners to represent the community at a more structured focus group meeting. Among those seated at the table were Karen Roper of the East Silver Spring Civic Association (whom JUTP interviewed last summer), who has been skeptical of the project; and Jim Johnson of the Long Branch Neighborhood Initiative, which supports the Purple Line as a means of redeveloping the Flower Avenue shopping district. "We have a lot of density in isolated areas," says Johnson, a Flower Avenue resident. "People have to walk a long distance or catch the bus [for groceries] so we bring people to the amenities." While the general audience didn't have as much access to State officials as they did last week, Purple Line opponents made their opinions clear. In an e-mail to JUTP, King relayed an incident where a member of the audience claimed the Purple Line would create pollution; an MTA official who suggested otherwise was "shouted down with 'where do you live?'" from the audience. Rebecca F. Motz, executive director of the Springvale Terrace retirement home on Wayne Avenue, suggested that the MTA wasn't listening enough to local concerns. "Hasn’t anyone learned that building something new is not always the better solution?" asks Motz. "How about fixing what we already have since we know it works and is not disrupting those who live here?" Discussion centered on a proposal to route the Purple Line on Wayne Avenue, taking lanes currently used for auto traffic. Many asked project director Mike Madden why the transitway couldn't be placed underground similar to another alignment on Silver Spring and Thayer avenues. Frustrated with his refusal to consider their demands, Seven Oaks residents Carol and Allan Leventhal brought their complaint to several Montgomery County Council members in an e-mail sent this morning. "It would appear that no serious consideration is being given to this alternative because of the cost involved," laments the Leventhals in the e-mail. "What is sacrificed in the process is the cost to this community." Many residents seemed well aware of the Purple Line's potential costs to East Silver Spring. "We're all for the Purple Line," says Johnson, referring to the Long Branch Neighborhood Initiative. "But we realize it'll probably gentrify the community." The Purple Line would not only gentrify communities, it would displace residents, businesses and wildlife. Renters would be out quickly -- and to where? Housing affordable to the working class seems to be vanishing, not being built. 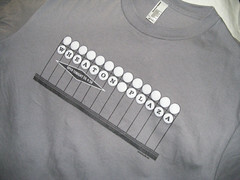 Metro stops seem to aggravate that trend, "light" rail would do the same. Small businesses are extremely vulnerable. Homeowners face eminent domain threats not just for the trackbed, but for transit-oriented development, in light of the US Supreme Court's Kelo decision. Instead, improve the bus systems we have, and everyone stays. If you kept all law enforcement out of East Silver Spring, it would prevent gentrification much more effectively than keeping transportation out of East Silver Spring. Arguments like Nancy's means we shouldn't do anything about global warming either, because critics claim it will effect businesses and people's livelihoods. Wake up to the 21rst century. Just like we need to fix global warming, we need a purple line. Jesus H Christ what is wrong with SS that gentrification is NOT a desired outcome I don't understand you people. With that being said - purple line equals gentrification - by all means Mike M start digging away! I'm waiting for case studies to get my opinion on this purple line, at this point I agree there is a lot of ignorant fear and conjecture from audience participants. Despite what Ms. King suggests I do not think that residents of East Silver Spring are being unreasonable to question and critique a $2B project that will place a rail line through their front yards. As this blog title suggests, why not consider just up the pike? What a fabulous way to take cars off the road by accessing existing park and ride lots up colesville, thereby reducing both existing and future car congestion, and replace those MTA commuter buses. Why doesn't this blog or any publication seriously consider this question? It seems to many of us that the Purple line is being pushed based on the rationale that any public transit is good without critically thinking about what would meaningfully reduce congestion and cars as well as the impact on neighborhoods and quality of life. I, like many in East Silver Spring, take buses and rail and I don't know that $2B is needed to upgrade the existing bus system--it is flexible and serves us well. Ironically if the purple line is built I may lose my frequent bus line (the #15) without gaining an accessible purple line stop. This is why I will no longer attend these public forums - people arrive with theirs mind already made up and do not LISTEN to the speakers at all. There is lot of hate spewed and everyone has their own ax to grind. I feel bad for the folks that have to run these kinds of events. If some order was maintained and there was some respect for those who have the floor, reasonable folks might attend these things. Purple Line supporters tend to be hate-filled hippies who have already made up their mind that they support this boondogle. They fail to consider the evidence - the failure of light rail in Baltimore and other cities. Light rail is an outdated technology that should be relegated to minor routes such as US 29 and Viers Mill Road. The Purple Line is a component of the regional transportation system. only BRT can accomodate that purpose. Washington Gardener is the biggest phony of all time. She says "people arrive with theirs mind already made up", yeah like you arrive at the meeting with an open mind. If you disagree with any of these Purple Line zealots you are either a NIMBY, an idiot, or a racist who hates Latin Americans. We should let all the Purple Line Now zealots continue their Circle Jerk that is diminishing in size. Meanwhile the people who actually want to address the most dire transporation problems should write their local/national politicians to have the Corridor Cities Transitway built. And by the way, just in case the disinformation campaign has gotten through to you. The Purple Line will be no more a part of the Metro Rail System than is a Metro Bus. Disinformation at work! Boston's light rail Green Line is part of the "T", and the Purple Line will be part of our Metro system. Logic! Don't build the Purple Line because developers own land along the right of way and we already have bus service in the corridor. Instead build the Corridor Cities Transitway which will take 29 minutes for a trip from Germantown to Shady Grove that a bus can do in 12 to 15 minutes, and whose basic function is to be an excuse for developers to build office parks surrounded by parking lots. Please I hope we will build both the Purple Line and the Corridor Cities Transitway and every other thing we can do to make it easier for people to ride transit instead of automobiles to get where they need to go. Transit advocate, building big bulldozing projects only leads to more big bulldozing projects. A station is built, developers agitate to intensify zoning, and more crowding comes. Look at the area near Silver Spring Metro station now. Even as big, boxy apartments have been and are being built, a developer is trying to tear down 1/3 of the Falkland Apts., to replace with an expensive hi-rise. They call it transit-oriented development. The apts would rent for at least twice what the Falklands rent for now. The complex was designed as "decent housing for working people." Buses don't have this effect, they just take people where they need to go. Hi Nancy. Do you think the phenomenon you're describing has anything to do with the fact that the population grows naturally and people need places to live? Yes, absolutely I would happily pay more for gasoline if the tax increase were used to expand mass transit. 10 cents, 15 cents, 20 cents more per gallon -- any of those would be fine with me if it meant substantially increased transit. I may attend an event with some pre-formed opinions, but I'm certainly open to have them changed if presented with facts and logic. That is why I have decided yet for myself which path thru East SS the PL should take -- more research is still needed. I also don't shout down and interrupt speakers or other attendees when they make their comments. Just because you don't like what someone has to say doesn't make it a lie. BTW ACT is working equally as hard to get the CCT built - the ploy to pit PL against CCT is just ridiculous and pretty desparate. Does ACT have a CCT website, NO. When and where are they working hard for the CCT project. 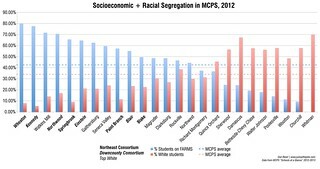 I have yet to see anything from ACT or Porcari's MTA that shows that both projects are getting equal attention. Check the MTA website and look at the Purple Line Link vs the CCT link. ACT is not working hard for the CCT because there is less development money to fund their pathetic "one trick pony" of an organization. I am not willing to pay addtional taxes for a project "Purple Line" that is a hyped up boondoggle. Hopefully Gov. O'Malley won't be as big a disaster as Parris Glendening who in my opinion was the biggest disgrace as a MD politician since Spiro Agnew. Governor O'Malley, please, if you any of your staff are reading this please do not follow Franchot and these "left wing" morons who will have you locking the state into supporting this "White Elephant" of a system that will not relieve traffic in MD. Note the PL and CCT pages - the PL has about a two decade headstart over the CCT so that will account for the much larger amount of info and research available on that project. Your insults and smear tactics are baseless. Get a backbone and actually put your name to your posts. Maybe someone would actually respect your opinion. Are we Purple Line supporters left wing morons or are we pawns of the capitalist developers? The opponents don't have good arguments, and they aren't even consistent in their name-calling. The Purple Line has support from people who are on opposite sides of almost every other issue, because it so obviously makes so much sense. Yes, there are real estate developers who support it and will make more money if it's built. Anything that improves the community will increase the value of real estate. Does that mean we need to wait to build any new housing or any transportation improvements until after the revolution abolishes capitalism? WashingtonGardener you are so delusional that you don't see that most of the citizens of Maryland agree with my opinions on this sham of a project. If you would stop the doctored Metro Maps and the lies saying that the Purple Line will remove auto traffic this project would have died years ago. anonymous of 11:50 p.m. 10/24: How is it that you are able to channel the opinions of "most of the citizens of Maryland?" Based upon the campaign rhetoric last year, I would bet that most polls show overwhelming support for the Purple Line. When you say "most of the citizens of Maryland" are you really talking about "most of the members of the Columbia Country Club?" Ah, Truth Squad, most people in Maryland don't give a hoot about the Purple Line because except on very rare occasions would someone from Baltimore or the Eastern Shore need to use it. Common sense. Most people in Montgomery County don't care about it otherwise Steve "Sick of Traffic" "Mr. Purple Line" Silverman would be County Executive. It is a relatively small rather delusional bunch that think the are in the majority who support this boodoggle. I will repeat, if the public knew that the Purple Line will not be part of the existing MetroRail System and that it will not remove traffic from the roads, the project would have long since been buried. You "Purple Line Now" folks have to try to deceive the public by doctoring maps of the MetroRail so people think the Light Rail will be part of the system. It will be no more part of the system than is a Metro Bus. Truth Squad try some truth, it shall set you free, mentire. If you are going to doctor the map why not show the Amtrak at New Carrollton and Union Station, or where the MARC trains connect with MetroRail. Hey how about all of the various MetroBus Lines that connect to each Metro Station. What is the difference? "As this blog title suggests, why not consider just up the pike? What a fabulous way to take cars off the road by accessing existing park and ride lots up colesville, thereby reducing both existing and future car congestion,"
I don't get what your goal is. What is it you want done with the pike? Having used the park and ride lots in Burtonsville I can tell you they are just about the worst way to get around. The buses have no dedicated lane for 2/3 of the trip in so you get stuck in traffic, and the Metro buses are notoriously unreliable, adding to the problem with the once an hour pickups they have there.